That's Hillsdale Bank, as in lending institution, not gently sloping landscape or edge of a river or stream. As pastoral as Hillsdale Bank sounds, Greg and Donna Beverlin's restaurant in Hillsdale, Kansas is actually in an old bank building. They've been at it for over 25 years and have won a lot of fans in the Greater Kansas City Area. Yes, they're from the Greater Kansas City Area, and this is definitely a Kansas City Style Sauce. It's thick - one of the thickest I've come across, actually. It's smooth - no noticeable bits or chunks. It's quite a bit sweet and quite a lot smoky - in fact, it's one of the smokiest I've come across. This is the HOT version, so there is some noticeable burn on the back end. I love the clean, simple label. I love that the ingredient list is so short. And I love that it's billed as 82% organic (never seen that before!). Overall, it's got a nice balance between the sweet, the tangy and the spicy, but maybe has just a little more smoke than I usually prefer. Have you ever heard of a barbecue sauce with "barbecue sauce" as one of its ingredients? Actually, a lot of the competition cooks are probably nodding their heads right now. Even apart from the sauces used in the meat categories, many a sauce category entrant has taken a commercially available sauce, doctored it a bit, and turned it in. But a commercially produced sauce with "barbecue sauce" as an ingredient? That's a new one on me. Then again, Kenny Nadeau and Mike Smith, who started the Uncle Kenny's brand and still run it today, are competition BBQers. Yes, in addition to running a popular restaurant and catering operation in Central Florida, and selling their line of sauces and rubs, the UK guys still compete in FBA and KCBS. And very well, too - they won a Grand and a Reserve in 2015. Despite operating out of Florida, these sauces are definitely in the style of Kansas City - thick, rich, smoky and sweet. The Original version has an excellent balance of sweet, tangy, savory, spicy and smoky flavors - no one flavor is dominant and the result is a great tasting sauce. The Mustard version is like a really octane honey mustard sauce. It kicks up the sweetness and the heat a couple of notches, which is needed to balance the strong yellow mustard flavor. 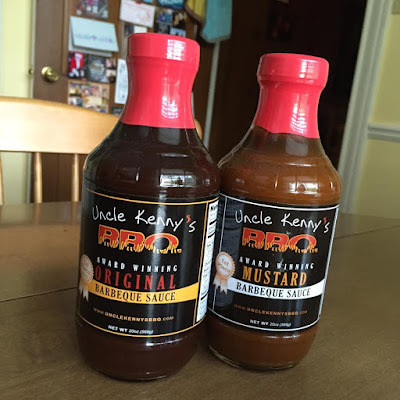 Both sauces are exemplary and fine examples of how to balance the flavors that make a great barbecue sauce - even if the first ingredient is...barbecue sauce. If the name "Pork Barrel" makes you think of politics, that's no coincidence. Heath Hall and Brett Thompson got the idea to get into the barbecue business while working in Washington, D.C. for former Missouri Senator Jim Talent. When Talent lost his reelection bid in 2006, Hall and Thompson went whole hog into the barbecue business, developing a sauce and eventually a barbecue restaurant in the D.C. area. The Original version of the sauce is a dark amber color, specked with spices, and is of medium thickness. The taste is immediately more tangy than sweet, with notes of smoke, chili powder, and celery complementing the vinegary tang. As expected, the sweetness takes the lead in the Sweet version, with the tanginess taking a back seat. The sweetness is complex, with tones of molasses and tamarind, and a little bit more heat. The Mustard version is slightly thicker, with plenty of flavorful bits in the mix. Yes, there's mustard, but it's also got plenty of sweetness, a bit of tomato flavor and still more heat. 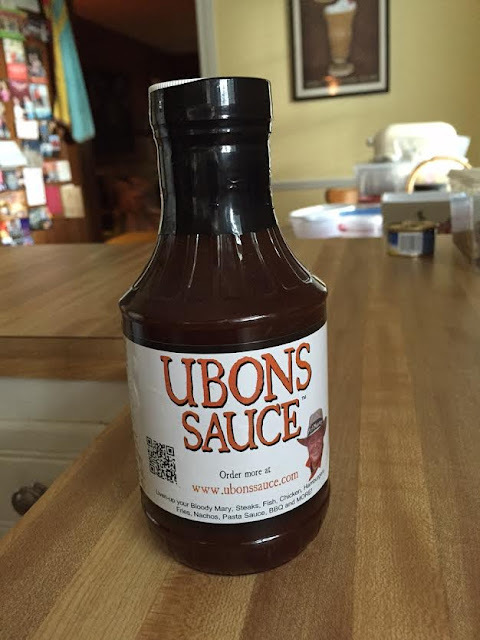 Ubon's is another competition team that has been in the game a long time and seen a lot of success and accolades. But in this case, the sauce came long before the Grand Championships and the restaurant. Garry Roark created the sauce in 1986, based on his father Ubon Roark's recipe, which dates back several generations even before him. So this is definitely a sauce with some history. And yet it totally translates to the 21st century. I like the bold look of the label. I like that it's got Mr. Roark's smiling face right there on the label, opposite a QR code - old school and new school. And I like that it tells you how to pronounce the name right there on the side of the bottle - "YOU-BAHNS". The sauce itself is a pleasantly tangy one, developed in an age before everything had to be so darn sweet. It's a bright burst of vinegar flavor on the front end, balanced by just enough sweetness. The finish is more savory, with the faintest trace of heat. It's a sauce that would likely be a great complement to pork. And Ubon's makes what's reputed to be a killer Bloody Mary mix, too - for your refreshment while you're cooking that pork. Melissa Cookston actually hails from Mississippi, but Memphis is where she's made her name. She's won Grand at Memphis in May twice and has won the Whole Hog category four of the last five years (!). She's appeared on BBQ Pitmasters as both a competitor and a judge, and is now a best-selling cookbook author as well. As of late, she has also been a restaurateur. After a previous career in chain restaurant regional management, Cookston opened Memphis Barbecue Company in the North Mississippi suburbs of Memphis in 2011. 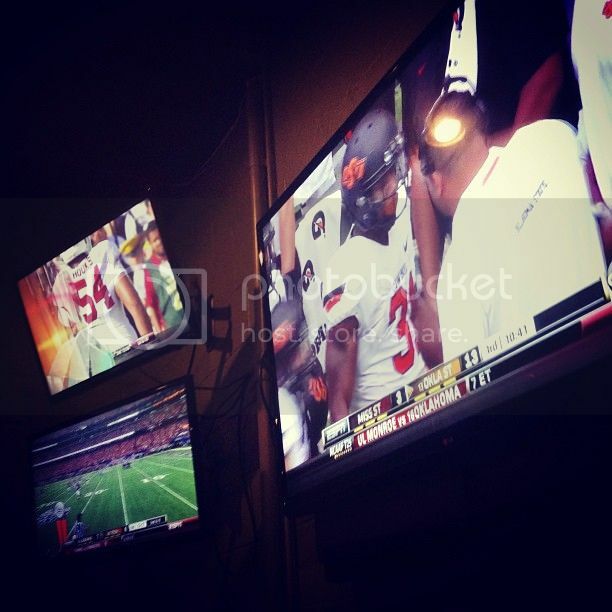 They have since opened locations in the Atlanta suburbs and in Fayetteville, North Carolina. And if you've got a chain of barbecue restaurants, you've gotta have a sauce! The sauce is typical of West Tennessee sauces in that it's ketchup-based, but has plenty of vinegar too, so it's not too thick. It's got that amber color and a texture that's smooth, but with some tiny bits visible. It's definitely sweet, but immediately also offers a rich, robust savoriness that sets it apart. It's an extra dose of Worcestershire, I think, and it's nice. It's followed by notes of garlic and onion that round out the flavor, and finally, a little bit of heat. Very well balanced, and overall, very enjoyable. Who says they don't use barbecue sauce in Texas? 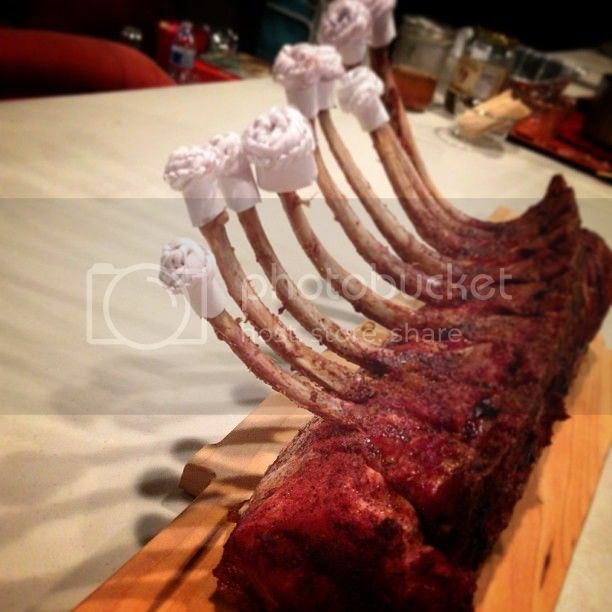 SuckleBusters call themselves "The Best in Texas" and they've got the accolades to back up that claim - Scovies, NBBQA awards, American Royal wins and more. The brand, created by Dan and Cheryl Arnold, has really blown up in recent years and is now available at over 350 retail locations across the country. They've now got a massive product line that includes rubs, sauces, salsas, chili kits and even jellies and preserves. If variety is the spice of life, SuckleBusters is truly bustin' with flavor. Take their barbecue sauces, for example - they've got six...six!...different sauces. It all starts with the Original. It's refreshingly thin (first ingredient: vinegar), with a glossy amber color and a nice smooth texture. And although the aroma is pretty pedestrian, the flavor packs a lot of punch. It's tangier and spicier than most barbecue sauces in this style, resulting in a taste that's bright and crisp at first and warm on the finish. From there, you can go in several different directions with SuckleBusters' other offerings. The Honey version tilts the balance away from tanginess and toward sweetness, bordering on too sweet. The Spicy Peach is tangier AND sweeter than the original, unmistakably peachy and more heat forward. It's a little thicker too. Hot and Spicy is very similar to the original, although somehow actually less spicy. The Chipotle and Gold flavors seem cut from a different cloth. Chipotle is darker, thicker and noticeably chunkier than the others. It's hotter and smokier, with a mellower sweetness, and it is probably my favorite. The Gold is much thicker and stickier. The mustard flavor is strong, but there are also notes of apple and a strong jolt of jalapeno - in fact, this is probably the spiciest of all the sauces. It is tasty, but it's not hard to imagine it overpowering many things you'd put it on. Mic check one two...is this thing on? OK, so it's been awhile since I've darkened the doorway here at the Ulika Food Blog. Like, a long while. I wish I had a good excuse for why I've been away so long, but I don't. I still love barbecue as much as ever; I guess I've just been selfishly keeping the good stuff to myself (or retreating further and further into my own isolation...take your pick). Anyway, I got my hands on some new barbecue sauces and thought, "Why not? If nothing else, just for old time's sake." So without further ado, here we go. Dimples comes from North Carolina, but this ain't no vinegar-based mop sauce. In fact, if I had to guess at its origin, I would have thought Kansas City. It's dark in color, thick, sweet and smoky. There is some vinegar tang and some Worcestershire savoriness that plays nicely with the sweet and the smoke. 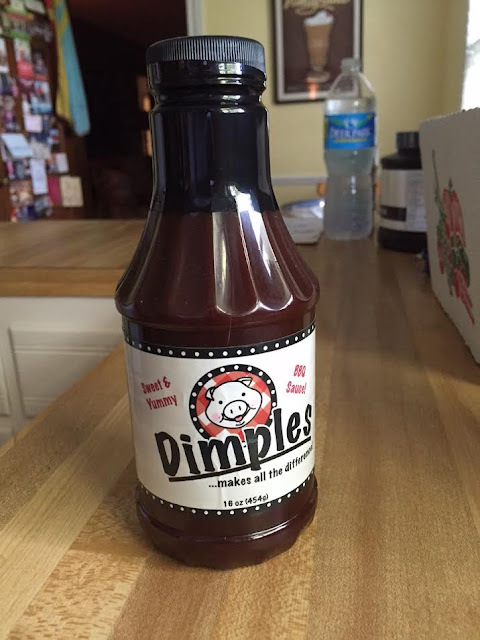 No matter where it come from, it's tasty - a great middle of the road barbecue sauce that is sure to be a crowd-pleaser. 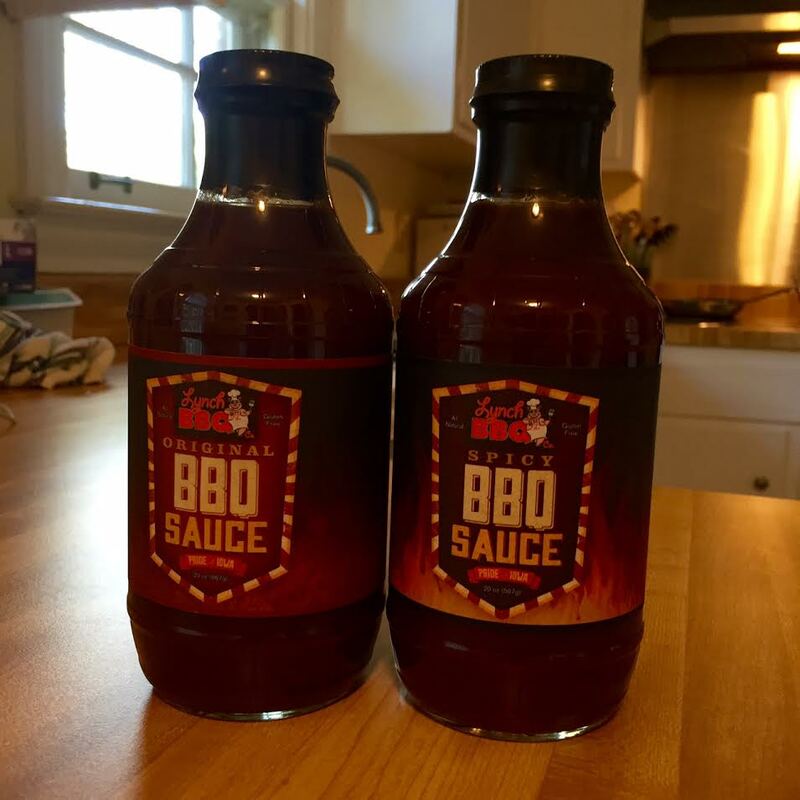 This week’s BBQ Sauce comes to us from the ATL Georgia made by the fine folks at Firebud Brands. 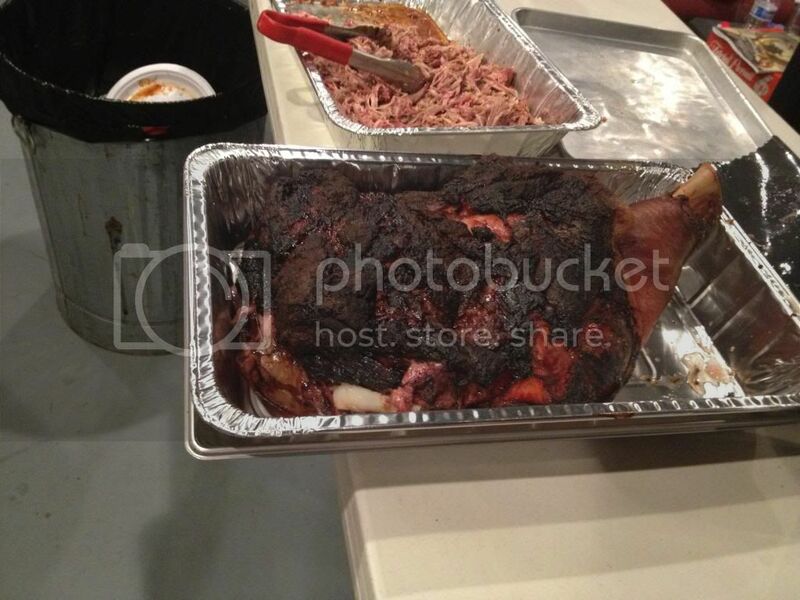 While cooking a whole hog at an SEC tailgate party Michael McCord was tasked with coming up with a sauce to compliment the succulent pig that had been cooking all night. What he came up with was a cider vinegar mustard sauce that would later be known as Slap Sauce. Slap Sauce is the signature sauce of Firebud Brands, and it is easy to see why. The sweet tangy sauce is a little sweeter than what most people think of when they think of a mustard sauces. Therefore, this sauce is much more inviting to those outside the mustard region. You get a little black and red pepper on the backend for a nice balanced finish. Overall, I think this sauce would be a great introduction to mustard sauces for most people, and I can see people who have never tried a mustard sauce really enjoying this one. Steve Ownby never imagined he'd wind up in the barbecue business. After retiring from a career in the insurance business, Ownby wasn't sure what to do with himself. 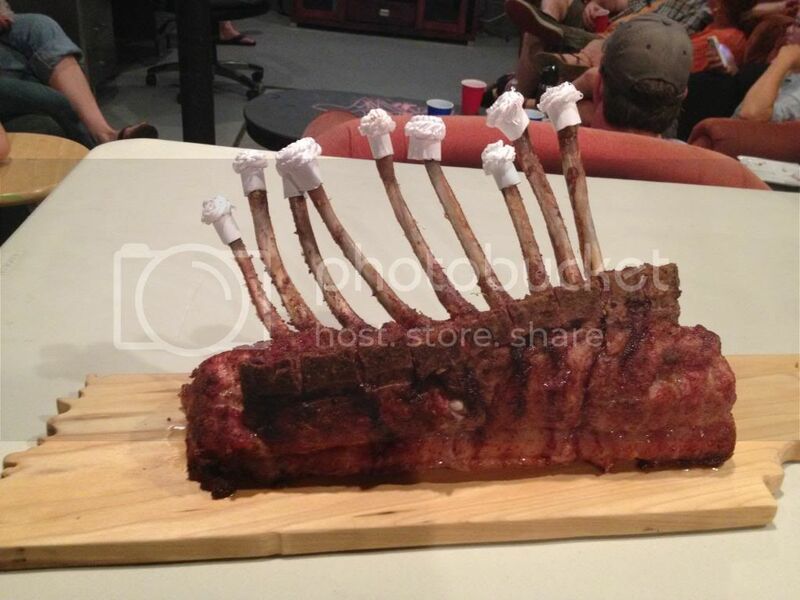 He didn't hunt, fish or play golf, but he was a KCBS Certified Barbecue Judge and enjoyed cooking in his spare time. And other people enjoyed what he was cooking. 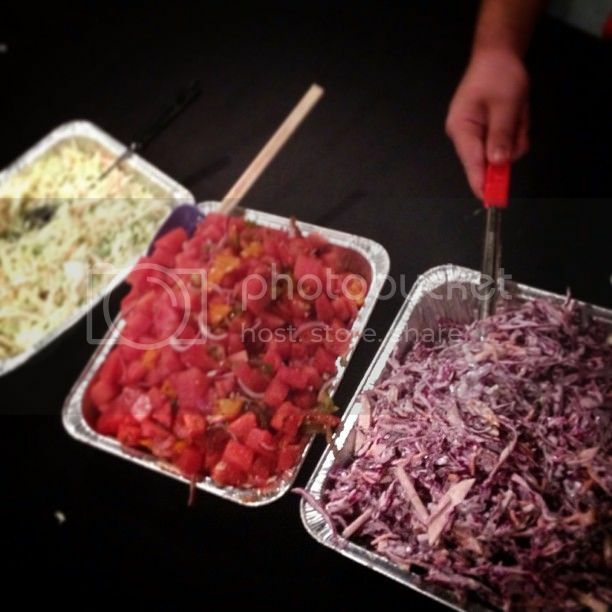 One catering call led to another and before he knew it, he had a full-fledged catering business on his hands based out of his home in East Tennessee - Holy Smoke BBQ. And after months of using commercially available barbecue sauces and rubs for his catering business, Ownby eventually decided he needed his own line of products. He developed the products under the tutelage of one of the best - Bill Arnold, of Blues Hog Barbecue fame. 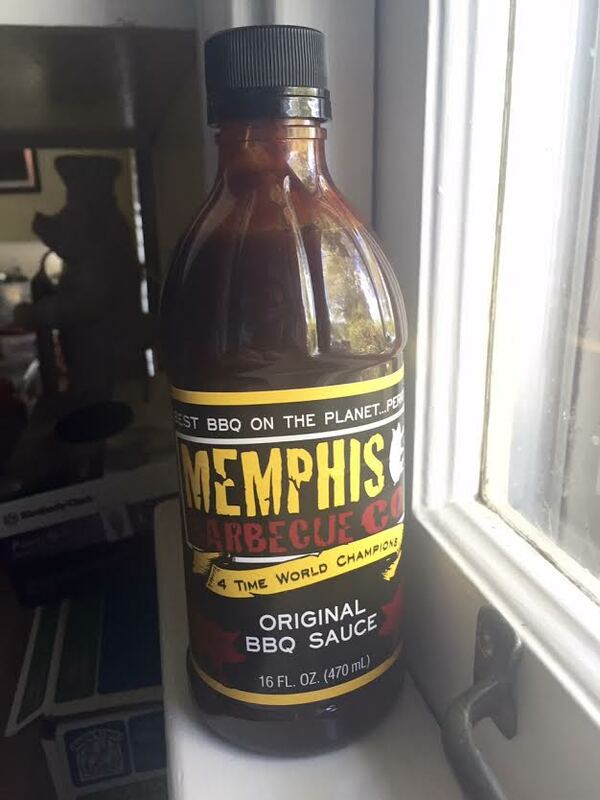 Long time readers of this blog know that Blues Hog is one of favorite barbecue sauces of all time. I have said before that I would eat shoe leather if I could dip it in Blues Hog. 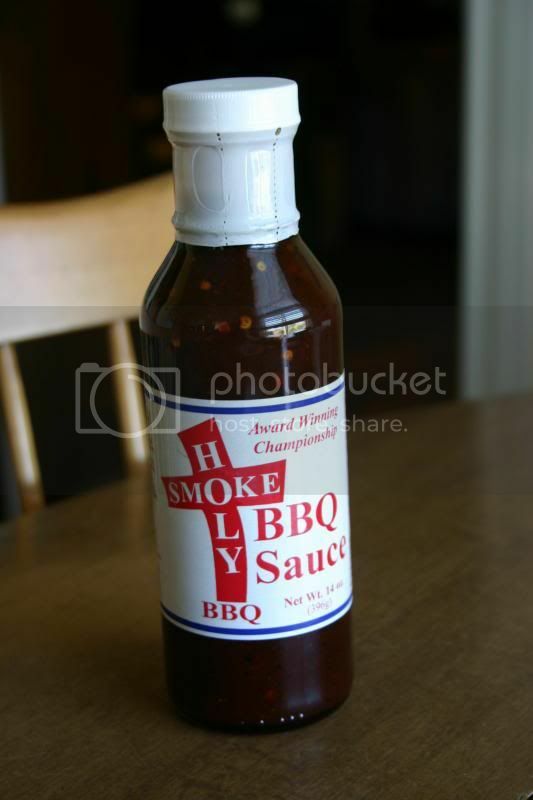 And I'm happy to report that Holy Smoke BBQ is a delicious apple that did not fall far from the tree. 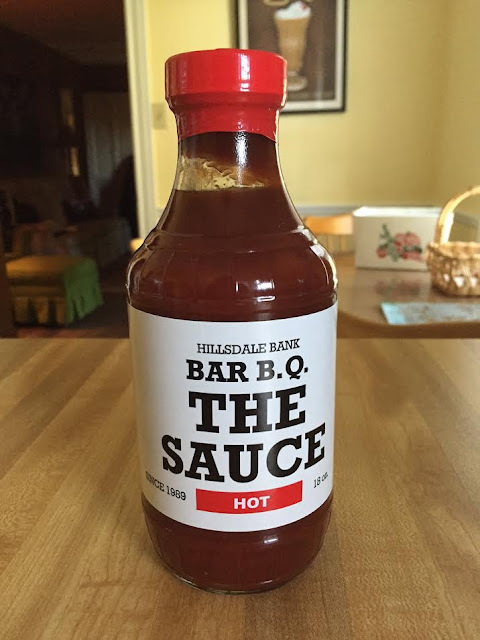 The sauce has a similar favor profile to Blues Hog - sweet, with a very mild burn on the back end, with some very interesting spice notes lingering in the mix. The consistency is thinner, though, which I like. Overall, this is simply one of the best sauces I have tasted. Do yourself a favor and give it a try! Who doesn't love a good family recipe? Using a recipe from your ancestors creates a connection through generations and lets those loved ones live on each time someone enjoys that special family concoction. I treasure those recipes that have been handed down from my grandparents and great grandparents. 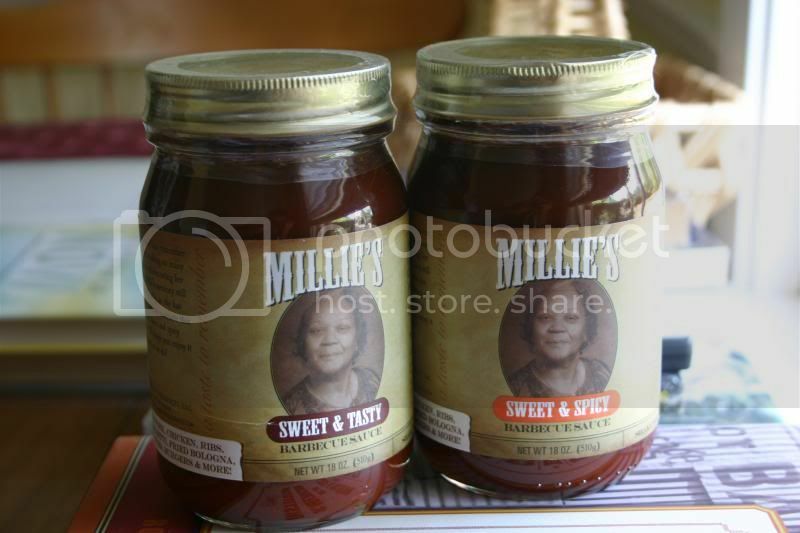 That's why I think Millie's Barbecue Sauce is so special. 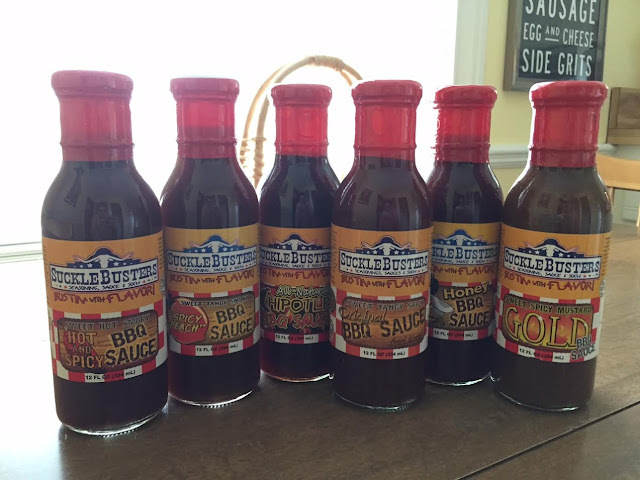 Craig Brown and his wife Toni have taken his mother's secret recipe for barbecue sauce and shared it with the world in these great barbecue sauces. The Browns began by selling their sauces at St. Louis area farmers markets, and their popularity is growing. The sauce comes in two variations - Sweet & Tasty and Sweet & Spicy. The Sweet & Tasty is a relatively straightforward Kansas City style sauce - thick and dark, sweet and sultry. Besides sweetness, there is a nice citrus-y brightness and a bit of vinegary tanginess. It's not quite as smoky as most KC-style sauces, but does have darker notes of molasses and raisins that are a nice touch. The Sweet & Spicy offers slightly more heat, though it is still quite mild. Jay Wilfong is a man of many talents. Based in Mt. Juliet, Tennessee, he's been making music in Middle Tennessee for many years under the name Dr. Fong (listen here). He's been a barbecue restaurateur several times in the last four decades. And now he's got a line of barbecue sauces called Jay's Hole in the Wall. 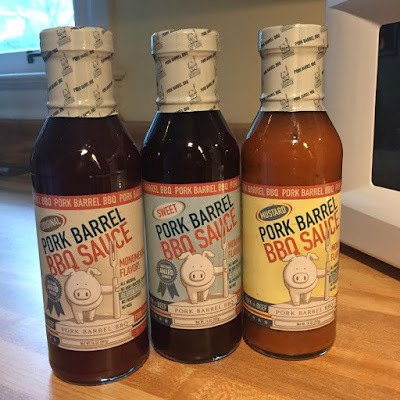 Jay's products are featured in Kroger stores, and you can see that these bottles will surely stand out among the other barbecue sauces in the condiment aisle. If the colorful motif makes you think of reggae and rasta, that's just fine with Jay - his culinary style is heavily influenced by the flavors and spices of Jamaica and the Caribbean. The wax coating on the top adds more tropical flair (although I found them somewhat hard to remove). 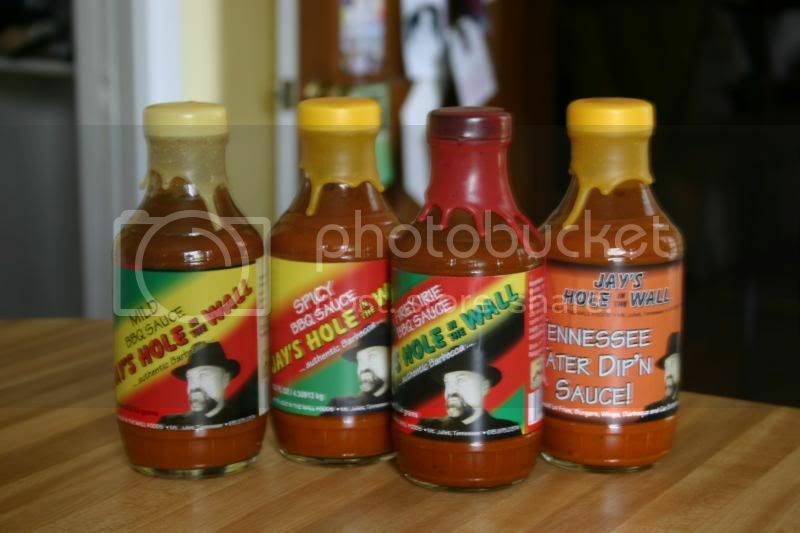 Jay's Hole in the Wall has four primary flavors - Mild, Spicy, Firey Irie and Tennessee Tater Dip'n Sauce. The Mild is a recipe that Jay developed over 40 years ago when he opened his first restaurant. It's a relatively thick, lighter colored sauce. It is tangy and sweet, with a lot of mustard flavor. The Spicy version is essentially the same sauce, but with more heat on the finish. 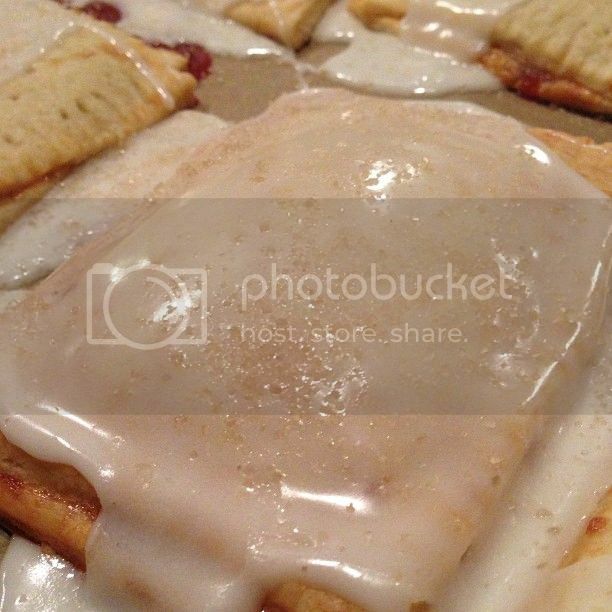 The heat of the Spicy version brings more balance to the sweet and tangy flavors. The Tennessee Tater Dip'n Sauce has the same color and consistency, and lies somewhere between Mild and Spicy on the heat scale. It also seems a bit more on the sweet side, with less tang, less mustard flavor and more exotic spices. The Firey Irie sauce turns the exotic spices and the heat up even higher. This sauce is legitimately hot, with an interesting complement of earthy and exotic flavors swirling above a base that is still fairly sweet. Overall, this is a fun and tasty line of products with a lot of personality - a great reflection on the man who makes them. Dario Cecchini: "Carne e Spirito" from MAD on Vimeo. This weekend we picked up a 190 lb. 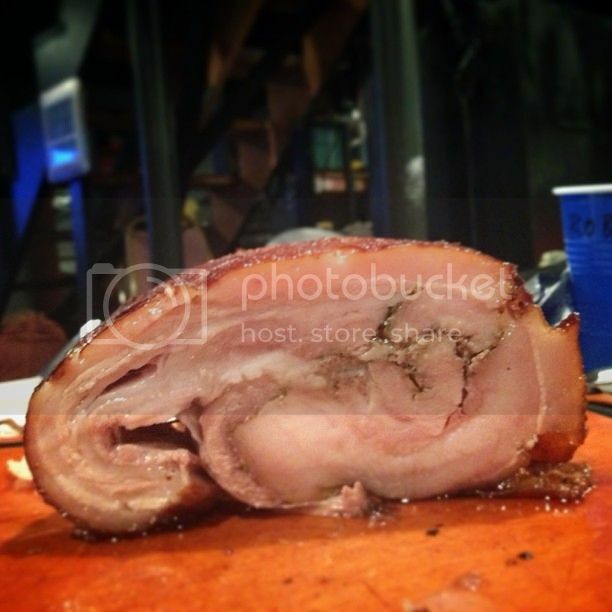 hog from the fine folks at Bear Creek Farm. Here is what we did with it. This is going to be incredible. Gene's Back-Room Wild Game Sunday Supper from Southern Foodways on Vimeo.